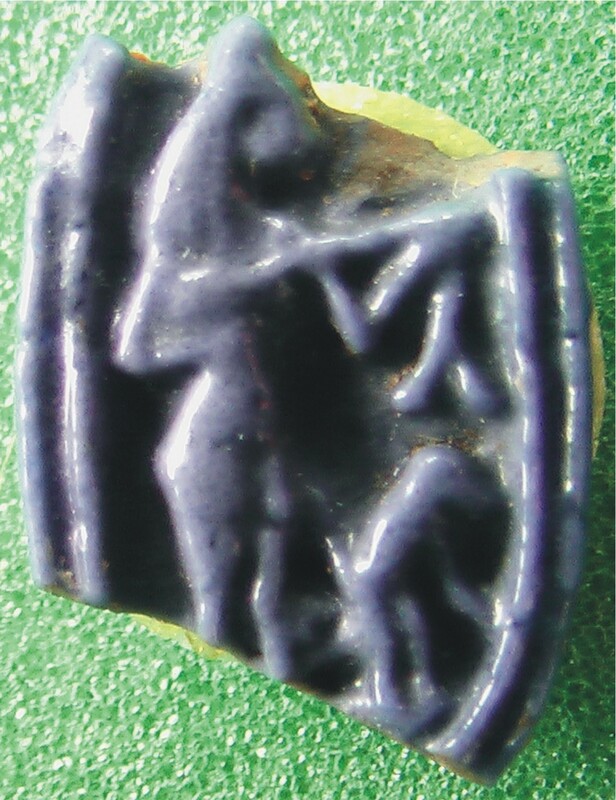 Broken faience or glass seal from Amarna of a lady musician with a monkey. The figure is twisted showing the naval and curve of the belly which is in keeping with the art of the period. She is naked or scantily clad and wears a cone on her head. The item was found in a house in the Northern City (Frankfort and Pendlebury 1933, 94). The ring-bezel motif of musician with lute is rare but not unique at Amarna (Graves-Brown 2014). The theme of lute player and monkey is also evident on a bowl from Leiden (Friedman 1998, 212). Music at Amarna appears to have been associated with offering to the king. The female musician here seems to be associated with revivication through the youthful and sexualised female. Female musicians could be high status individuals, even the daughters of kings. In the Amarna Period (c. 1353-1336 BC) the lute had only been recently introduced into Egypt. However the hair style of this lady suggests she is not of royal blood. Monkeys are associated with music and dance as well as female sexuality. The cone suggests divine offering. Ring bezels are found throughout Amarna, in both rich and poor areas. If you want to know more about Amarna we have a display which tells you more about the place and period. This includes a beaded collar with a dancing daemon upon it. Bosse-Griffiths, K., 1980, Two Lute Players of the Amarna Era, Journal of Egyptian Archaeology 66, 70-82 (Reprinted in ‘Amarna Studies’ edited by JG Griffiths 2001). Graves-Brown, C. 2014. A Gazelle, A Lute Player and Bes. Three Ring Bezels from Amarna, In Dodson, A. Johnston, J.J. and Monkhouse, W. (eds.) A Good Scribe and an Exceedingly Wise Man. Studies in Honour of W.J. Tait. London: Golden House, 113-126. Frankfort, H. and Pendlebury J.D.S. 1933, The City of Akhenaten Part II, The North Suburb and the Desert Altars: The Excavations at Tell el-Amarna During the Seasons 1926-1932. London: Egypt Exploration Society. Friedman, F.D. ed. 1998. Gifts of the Nile Ancient Egyptian Faience. London: Thames and Hudson. Reeves, N. 1985. ‘A Lute Player of the Amarna Period’ GM 87, 79-82. Stevens, A., 2006. Private Religion at Amarna. The material evidence. BAR International Series 1587. Oxford: Archeopress. Other items associated with music in the Egypt Centre.